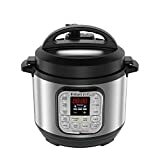 Not everyone needs tons of capacity from their multi-cooker, and Amazon’s running a great sale for those of you in search of something more compact. The Instant Pot Duo Mini 3 Qt 7-in-1 Multi- Use Programmable Pressure Cooker retails for $80 and it sports all the same cooking modes as the larger DUO60 (which is also on sale right now, by the way). If you hurry and snag one before Amazon’s deal is done, however, you’ll only pay $59.95!